Prepare and bake cake according to package directions, using a 13×9-in. cake pan. Let cool. Using a meat fork or the handle of a wooden spoon, pokes holes in the cake every 1/2-in to 1-in. Empty the jello packages into a medium-sized bowl and add the boiling water. Stir briskly for 2 minutes or until the jello is dissolved. Evenly pour over the poked cake. Place in the refrigerator for 2-4 hours or until jello is set. Meanwhile, make the frosting. Cream butter and the vanilla with an electric mixer. Add the powdered sugar and 3 tbsp. milk. Beat with an electric mixer until well combined and fluffy. Add a small amount of blue food coloring, beat well. Add more food coloring if more color is desired. If necessary, add 1 tbsp. milk to the frosting if it needs thinned out. After jello is set, top cake with frosting. Top with sprinkles. Linked up at these fun parties! If you need some red, white and blue inspiration, check out the blog hop below! This is a very beautiful cake! 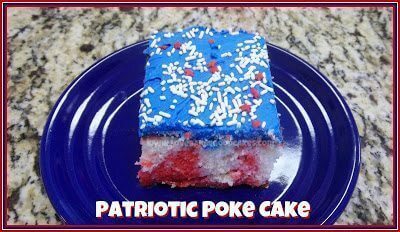 I have seen tons of poke cakes all over the internet, but have never made one. They sound so moist. I think I will have to put it on my list of things to try. This one caught my eye because I am hosting a patriotic link up party now through july 4th. I would love to have you share this. Thanks for stopping by Michelle 🙂 They are super easy to make and people love them! This is so pretty, makes such a striking dessert! Thanks bunches for stopping by & visiting! 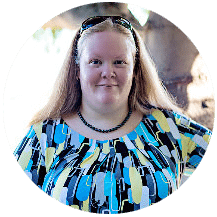 Thank you for the feature 🙂 I love all the patriotic links on your round-up! Nothing more heartwarming than seeing all the ways to show your American pride! I love this, it's so pretty! What a perfect cake for Memorial Day celebrations. So creative. Thanks for sharing at our party this week. greg great cake!! i tried to use red and blue jello to color vanilla icing..lets just say it didn't really work… we attend a 4th of July bash every yr and I never found a recipe I like….yours is it!!! thank you thank you!! A very fun cake for the 4th of July! I love all things patriotic! I am pinning this for my 4th of July celebrations:) Thanks for sharing at Freedom Fridays! Thank you Emily 🙂 I appreciate the feature! This cake is so festive and I love how easy it is to make the cake. Thanks for sharing at Showcase Your Talent Thursday! What a fun cake Jamie! 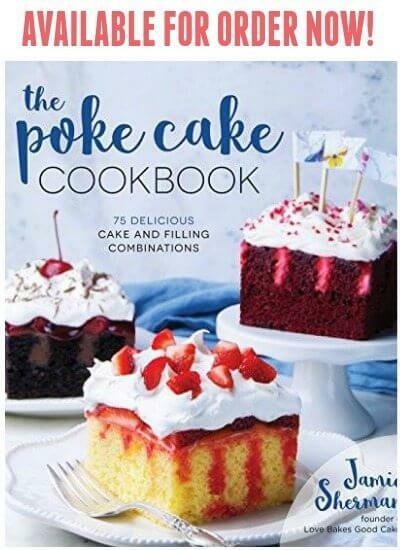 I love poke cakes! Thanks for sharing at Mom On Timeout! Yummy! Stopping by from FFF.